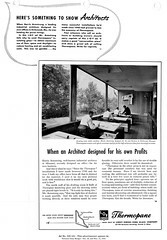 Advertisement with photograph of the drafting studio in Harris Armstrong's Architectural Office (1948). These large double pane fixed glass windows face north providing even consistent daylight for drawing. Lighting recessed into the ceiling was designed to come on only when light levels were low due to clouds, storms, etc. Armstrong collaborated with Libbey-Owens-Ford Glass Company on several projects including the Magic Chef Building his Missouri Solar Home (the subject of an upcoming blog entry). Armstrong objected to some of the wording in this proof and the advertisement was subsequently revised based upon his comments. From this interaction between Libbey-Owens-Ford Glass Company and Armstrong, its clear that Armstrong is specific and cautious about how his work and his office are portrayed. Armstrong worked hard to have magazines and advertisers pay for hiring the best architectural photographers. In this case, Ken Hedrich of Hedrich Blessing took the photographs as he'd previously done for the Magic Chef Building. In other correspondence of 1950 (writing to Architectural Forum), Armstrong comments that Hedrich takes excellent photographs that its a shame he cost so much. He also mentions he's never paid for any of Hedrich Blessing's photography of his work; its always been paid for by others. Advertisement courtesy of the Harris Armstrong Archives, Special Collections, Washington University in Saint Louis.